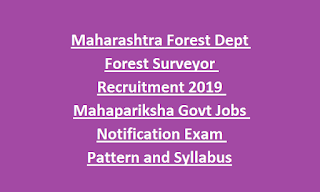 Surveyor jobs of Mahaforest recruitment 2019 is 14-02-2019. 12th pass and having Surveillance Inspection certificate they are only eligible to apply online for this Mahaforest Surveyor posts. Candidates selection will be based on written exam for this Forest Surveyor jobs recruitment of Mahapariksha. Written exam will be conducted for 120 marks for Forest Surveyor posts. 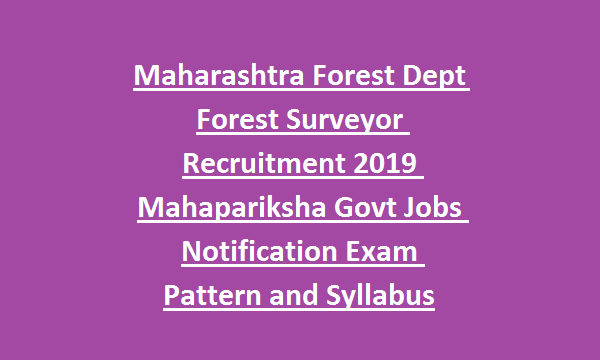 Exam Pattern and Exam Syllabus, age limits, Forest region wise vacancies and other details are given below for this Mahaforest Surveyor posts. There are total 51 posts are in this Maharashtra Forest Department recruitment of Forest Surveyor Jobs. Forest Region wise vacancies are given below. 12th pass qualification and Surveillance Inspection Certificate having candidates are eligible to apply online for this Forest Surveyor jobs through Mahapariksha.gov.in. Candidates selection will be based on written exam only for this Forest Surveyor Jobs. Written Exam will be conducted for 120 Marks. Written Exam Syllabus topics and exam pattern is given below. Apply online through official website of www.mahapariksha.gov.in. Online form submission last date is 14-02-2019. Exam admit card release date, exam syllabus pdf, exam result and other details are available in this website only.